Check out this update from our local Riverside BIA! 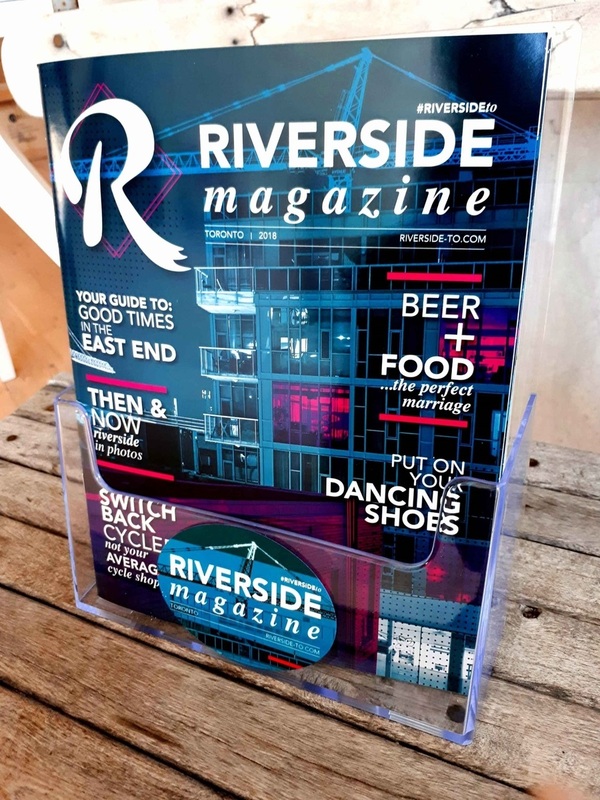 Hot off the press, and coming to Riverside and surrounding neighbourhoods starting next week, is our fresh new issue of the Riverside Magazine! The Riverside Magazine is an exciting annual publication that highlights life in this happening Toronto ‘hood. Original articles put a focus on food, entertainment, public art, and local products and services that make up the bustling 10 blocks of the Riverside BIA. With eye-catching photo spreads, in-depth local business stories, and a handy directory, the Riverside Magazine is a must-read for those who live, work and/or visit in and around this ever-changing Toronto neighbourhood. Riverside BIA businesses will be getting their copies of the fresh issue for 2018 next week along with an optional but very handy and professional magazine display. We know you’ll love this new issue! As part of the Riverside Walks 2018 series, the Riverside BIA is excited to debut a new Riverside Walk as part of the Doors Open Toronto official guided walking tours series on May 26th and 27th: in the theme of Film & TV! Riverside neighbourhood has been a film and TV hotspot for decades thanks to the area’s film-friendly ‘doors open’ policy. Home to the famous De Grassi Street which inspired the Degrassi TV series, Riverside has been transformed for “Cinderella Man” (2005), and more recently hosted shoots for TV series such as “Handmaid’s Tale” and “Taken”. The Riverside BIA’s tour will have you walking on De Grassi Street and in Bruce Mackey Park to learn about the origins of the TV series. Guests will also learn about filming at iconic Toronto’s landmarks including The Opera House, The Broadview Hotel and more. Riverside Eats & Beats is 1 Week Away! Go to the Polls for Fun on Saulter at Riverside Eats & Beats Streetfest! Shop these HOT BUYS & More at Riverside’s Eats & Beats Streetfest June 2nd! And more on the Riverside Blog! The Broadview Hotel – 106 Broadview Ave.
• North side of Thompson St. between Hamilton St. to Broadview Ave.
• West side of Hamilton St. between Queen St. East to Thompson St.
• On private property behind 106 Broadview Ave.
We will begin reserving the above areas with cones on May 26th at 8am, with vehicles arriving May 27th at 10am, and departing May 28th by 11pm. Displaced permit parkers; on our filming day, please approach any crew member and ask to speak to Sari Miettinen and Nabil Badine from the Locations Department. We will direct you to available parking and/or reimburse your parking receipt. Contract: 17TEY- 102TU, Start Date: May 16, 2018, End Date: June 6, 2018. The City will be repairing cuts made to the sidewalk, curb and/or road by utility companies, private contractors and the City when installing / repairing underground infrastructure (water, sewer, natural gas, cable, etc.). The repairs will take place on Queen St E from Davies Ave to Greenwood Ave. Work may include the closure of individual lanes or the entire road. Repair work will be coordinated with any maintenance work required with the City’s right-of-way. Property owners in the construction area are advised to remove any items installed or planted beyond the private property line and in the City-owned right-of-way that may impact construction. Work Hours: Work will take place from 7 a.m. to 5:30 p.m., Monday to Friday, with work after hours and on weekends as required. As shared in 2017, the Riverside BIA area is replacing its aging black metal benches for new City of Toronto mini benches. You may have noticed these new benches have began to be installed – 5 so far – and more in the coming weeks for a total of 15 new benches. This week the Riverside BIA office had the old BIA benches, and pls bear with us during this time of transition where there may be a gap between the old benches being removed and the new benches coming in. The old BIA benches are finding a new home with another BIA in Toronto’s west end. If you have any questions pls contact office@riverside-to.com or 416-466-8167. The Government of Canada is cutting taxes on small businesses to help them invest, grow and create jobs. they have lowered the small business tax rate from 11% to 10% in January 2018, and then to 9% in January 2019. Development charges are levied against new development to pay for the increased capital costs related to the provision of municipal services. The by-law levies development charges against all lands, buildings or structures within the City of Toronto, subject to exemptions contained in the by-law. The charges in By-law No. 515-2018 pursuant to Section 2 of the Development Charges Act, 1997, S.O. 1997, c.27 came into force on May 1, 2018 and will apply to all new residential and non-residential development, subject to certain terms, conditions and limited exemptions as identified in the by-law. The development charges imposed by the by-law are available here. Check Out “The Shop Up”- A Mom Pop Up Shop This Sunday!